This species is accepted, and its native range is Tanzania (Uluguru Mountains). 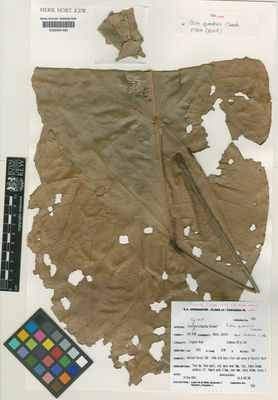 Leaf-blade oblongelliptic, 14–52 × 7.5–27 cm, acumen ± 1.5 cm, base obtuse, abruptly and shortly concave-cuneate, lateral nerves 4–5 on each side of the midrib; petiole 0.9–27 cm long, 2–4 mm wide, basal pulvinus 3–8 mm wide, glabrous. Cola quentinii was only known from the ± 385 ha Kimboza Forest until the recent collection by Mhoro, made after the account for this species was written. At least ten other taxa of flowering plant appear to be strictly restricted to the Kimboza forest. These taxa are: Annonaceae genus indet. A of FTEA, Impatiens cinnabarina, Garcinia bifasciculata, Ligelsheimia silvestris, Necepsia castaneifolia subsp. kimbozensis, Baphia pauloi, Cyphostemma sp. ‘P’ of FTEA, Turraea kimbozensis, Streptocarpus kimbozanus and Cola kimbozensis (Luke pers. comm., edited by Vollesen, 2005). Kimboza forest is notable, apart from the high number of strictly endemic taxa, for being (a) the only forest area of any size left on the lower (below 1500 m) slopes of the Uluguru Mts; (b) perhaps the best example of Tanzanian wet forest on Jurassic karstic limestone; (c) the richest of all East African lowland forests for avifauna (71 forest species of birds). This forest, although of very high conservation value, is gazetted as a production forest reserve, as much as 1 Of the canopy being removed for timber each year, under licence. Other pressures are pole-cutting and charcoal burning, according to Rodgers et al. (1983), The Conservation Values and Status of Kimboza Forest Reserve, Tanzania, from which most of the foregoing is taken. Quentin Luke (pers. comm., 2005) reports that between 1987 and 2001 there was noticeable degradation of the forest by humans. He considers the most serious impact, however, to be from the invasion of the exotic timber species, Cedrela odorata from the adjoining plantations. Careful selective removal of this species is a priority if the conservation value of Kimboza is to be maintained. A further threat is the destruction of the limestone substrate to produce building material, he reports. Cola quentinii is here assessed as CRB2a,b(iii) that is, critically endangered in view of the data cited above on its geographic range and habitat threats. Luke reports that in 1987 on a fleeting visit, he saw only a single tree. During his second visit in 2001 he found 3 or 4 trees. The species is probably rare even within Kimboza forest given that, despite the visits of numerous able botanists only two collections are known of the taxon, by one botanist. Given that it is very likely that less than 250 mature individuals of the species survive it can also be assessed as critically endangered on the basis of its estimated small population size (CR C1 + C2a(ii)). Since the name Cola kimbozensis is already employed, Cola quentinii was chosen to honour Quentin Luke, the Kenyan botanist who had made the only known collections of the taxon and who first raised the possibility that they might be new to science. The affinities of Cola quentinii, which falls in the C. stelechantha group (see notes under that species) are with C. lukei and C. rondoensis, both of which also have short-stalked flowers with poorly developed membranous margins to the perianth lobes. It differs from the first in the characters mentioned in the diagnosis, and from the second in that its bracts appear caducous (not persistent and sheathing), in the stellate-hairy androphore and in the glabrous inner surface to the perianth lobes (not glabrous and stellate-hairy respectively). More collections are needed to complete our knowledge of the species.